Dr. Hak Ja Han Moon joined 10,000 people for the “Peace Starts With Me” rally. In addition to various musical performances celebrating peace and unity, she delivered the keynote address, encouraging everyone in attendance to become a shining light in Europe, helping actualize a world of peace as one family under God. The Peace Starts with Me Festival began with a very warm and bilingual welcome to the many people who had gathered from all over the world to hear her speech. Among the guests included a delegation from Japan, as well as the participants of the international leaders’ conference organized by the Universal Peace Federation (UPF). The Longfield Gospel Choir kicked off the program with several energetic and beautifully-arranged gospel numbers, including Every Praise Is to Our God, which featured a group of equally energetic young Family Federation dancers who previously promoted the event in the streets of Vienna. Family Federation for World Peace and Unification (FFWPU) Austria National Presidend Elisabeth Cook and FFWPU Europe and Middle East Regional Chair Dr. Michael Balcomb introduced the goals and purpose of the festival. Dr. Balcomb stated that it would make an impact if 10,000 people were to say “peace starts with me.” He then asked everyone to stand up and tell five other people that “peace starts with me.” Dr. Balcomb expressed his belief that just as men and women have dreamed of peace, God has also been dreaming of peace. As Dr. Balcomb explained, just as the coming spring cannot be stopped, so it is with the coming era of peace. The history of darkness is about to end and the history of peace is about to begin. Attraction, a Hungarian shadow dance group, then took the stage. The eight dancers performed behind a special screen and created beautiful images formed by their own shadows. Then came Spark, an energetic modern ballet which featured some of our most talented young Family Federation members. The opening prayer was a touching Christian invocation of God’s spirit by a Catholic priest who came to the podium with a young woman who then sang her own prayer in Aramaic. A musical dedication featured our own diva Seiko Lee, who sang a classical piece by Vienna native Johann Strauss. Ms. Lee sang first by herself and was later joined in a beautiful duet by Mr. Kastriot Tusha from Albania. Next, the crowd watched a brief but poignant video which gathered together some of the young voices explaining what Peace Starts with Me meant for them personally. The emcees asked the audience members to take a minute or two to explain their own thoughts and feelings about peace with one another. 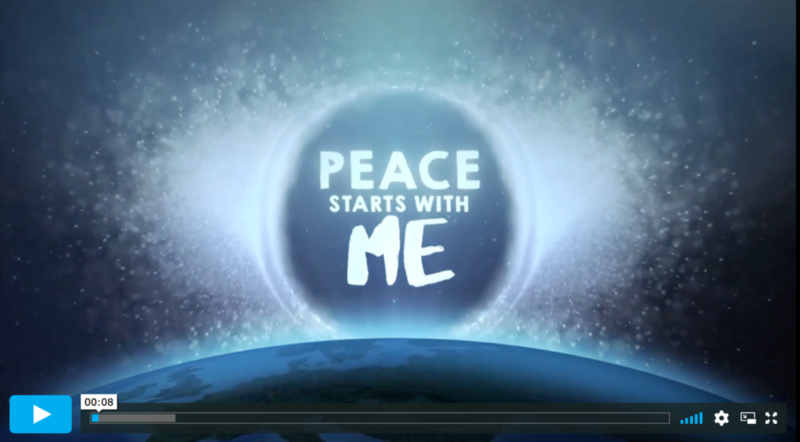 A second video presentation which briefly introduced True Parents’ global work for peace was short and to the point. Then former Austria Defense Minister Dr. Werner Fasslabend personally introduced Dr. Moon as the keynote speaker. Referring to his long experience in public office, he expressed his insight that it is relatively easy to disturb peace but tough and time-consuming to restore and keep peace. He concluded that the task of bringing peace is not just in the realm of religion, politics or the military, but in ourselves. “Peace is me. Peace is all of us,” he said to applause. He referred to the teachings of “the late, great Dr. Moon, and his wife” when he remarked that before anything, we must master ourselves. Dr. Fasslabend explained that we must first have inner peace as the basis to convince others to create peace among themselves, among society, and among the world. After Dr. Fasslabend spoke briefly about Dr. 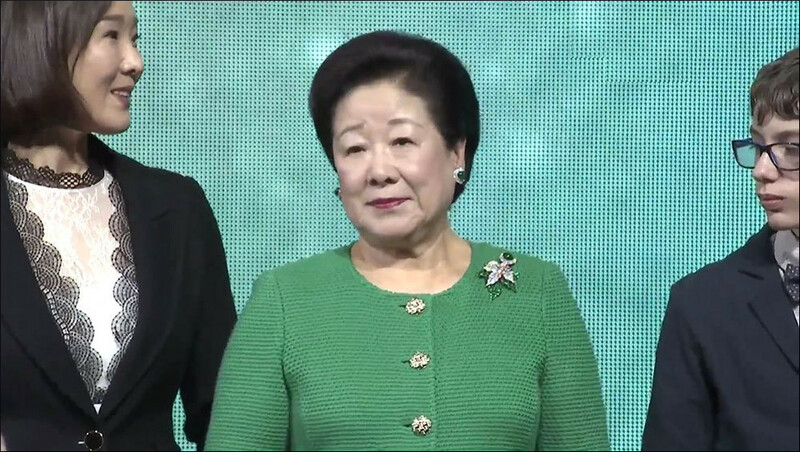 Moon life, including her marriage to True Father and the fact that she had 14 children and more than 40 grandchildren, she came out to the podium accompanied by Sun Jin Moon, President of Family Federation International. Dr. Fasslabend welcomed Dr. Moon warmly to “this city of music and peace,” offering her his best wishes for the future of her work. When Dr. Moon spoke, she welcomed everyone and thanked religious leaders, Ambassadors for Peace, and members for coming. She particularly mentioned those who had traveled from Moscow by bus on a 30-hour journey, as well as a group of important religious leaders from Africa. “Christians received unspeakable persecution in the early days. After Rome recognized Christianity, it traveled through the European continent, from the Italian Peninsula, crossing to an island nation, Great Britain. Then the nations centered on Britain spread [Christian faith] out to the world under Christ’s name and opened the Atlantic Civilization Era. However, they did not know Christ’s essence. Caught up in their own selfishness, they put the benefit of their own nations first. So the result was different from what they had intended. In the end, rather than a movement that gave true love, it ended as a culture that took much away. Dr. Moon acknowledged that many young Family Federation members are working actively for peace in the world, and said that such a way is the only way for humanity to realize a true world of peace. Today there are seven and a half billion people in the world. They are living at the same time of True Parents, but how great their pain will be if they leave this word without knowing it! A group of beautiful young children then offered bouquets of flowers, one by one, to Dr. Moon. Two tribute messages were read. One was from the president and deputy president of the Association for the Promotion of Peace, which bestows the Flame of Peace Award. The other was a declaration, offered by 300 Ambassadors for Peace who had gathered, of their commitment to overcome the barriers to peace. Entertainment followed, with musical offerings by Seiko Lee and Serbian pop star Nevena Bošović. The afternoon culminated with gospel music from renowned American Gospel artist Yolanda Adams.